The anti-steakhouse experience after the jump. 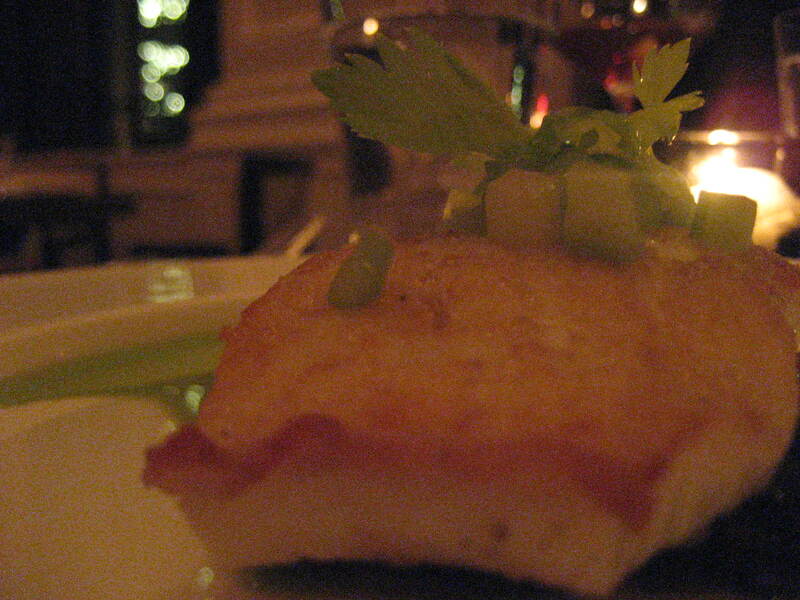 Your first clue that J&G Steakhouse will be bringing more than your average meat-and-potatoes meal is the location. The host stand is at the far end of the W hotel lobby, and just getting there required us to negotiate past two separate sets of velvet ropes – one for a private party upstairs and one for the lounge area to our right. But we were greeted warmly when we gave our name and quickly ushered to a table in the dining room. And that’s your next hint: the dining room itself. The space is vertically huge. A soaring ceiling and squared columns could have given it an austere feeling, but there are aesthetic touches throughout that add warmth and elegance. We were drawn to the high-backed banquettes that seemed equally suited to either a romantic rendezvous or a serious sit-down. And the pattern that adorns the ceiling itself made us smile when our eyes finally made it to the top of the room. Finally, there’s the menu. This is not a simple steakhouse menu of cuts and sides. J&G Steakhouse bills itself as “a compilation of Chef Jean-Georges Vongerichten’s favorite dishes from his New York restaurants and an inspired menu of worldly steakhouse classics.” Before you even reach the steaks in the “From the Grill” section of the menu, you’ve got a half-dozen options including several preparations of fish, lamb, chicken and beef shortribs. Appetizers and salads are similarly expansive. As if to emphasize this, J&G’s Restaurant Week offerings were notably lacking in steak. Their RW menu was a variation on their normal pre-theater menu (regularly available for $39 per person), with a substitution of the glazed shortribs forthe usual petite filet. For each course you got an either-or pair of choices, which certainly makes it easy when dining as a duo. The lack of options was a little disappointing (during 2010’s winter restaurant week the restaurant offered four choices per course), but the meal definitely was not. We were offered a choice of butternut squash soup with fall mushrooms or a Caesar salad for our appetizers, and as is our usual M.O. in cases like this we ordered one of each. 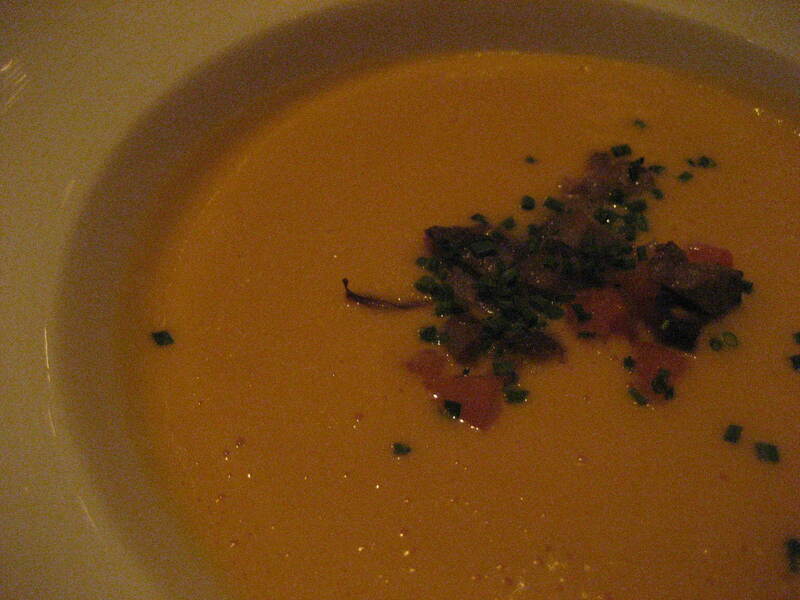 The soup was silken and rich, with a nice earthy note coming from the chopped mushrooms. Even so, I was out-ordered on the first course as Elizabeth’s Caesar salad brought a surprising depth and some welcome heat. We couldn’t place it, so we asked our server who told us the dressing included two secret ingredients to amplify that traditional Caesar umami: mustard and chili. After an appropriate interval, our entrees arrived: seared atlantic cod in a chili sauce and those glazed shortribs I mentioned earlier. Both were cooked well, with the skin of the cod nicely crisped and the shortribs all but falling apart as I brought my fork to them. With their accompaniments of carmelized onions, spinach and potatoes the shortribs made for a satisfying meal, but the balance of the cod and its slightly lingering heat won the round for Elizabeth. Dessert was pure comfort food, regardless of which dish you went for. A tart green apple crisp was accompanied by a rich cinnamon ice cream, and a plate of cookies cried out for a tall glass of ice-cold milk. 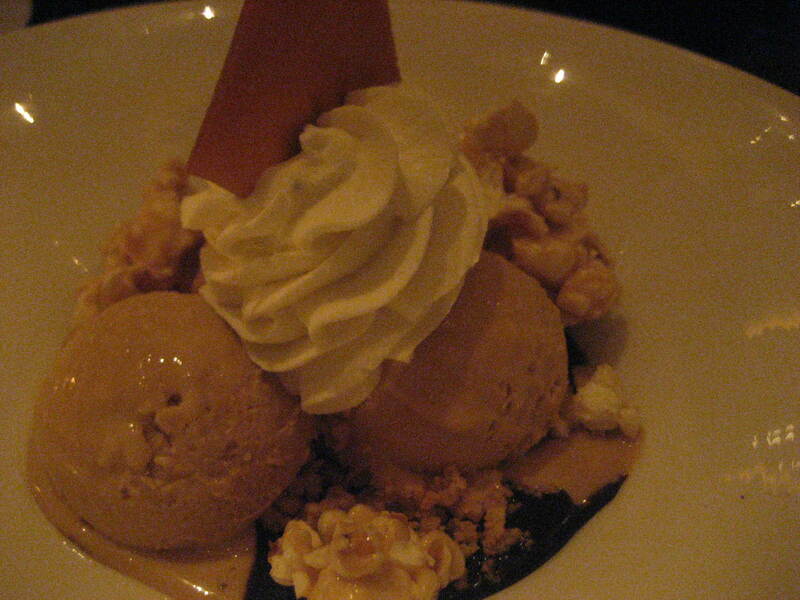 Our server went the extra mile and brought us an additional dessert after an early (and quickly forgotten) sloshing of a cocktail, and it proved to be the real winner: a salted caramel ice cream sundae that included popcorn, peanuts and chocolate. It was a heady blend of salty and sweet and I’m not ashamed to admit we scraped the bowl clean. 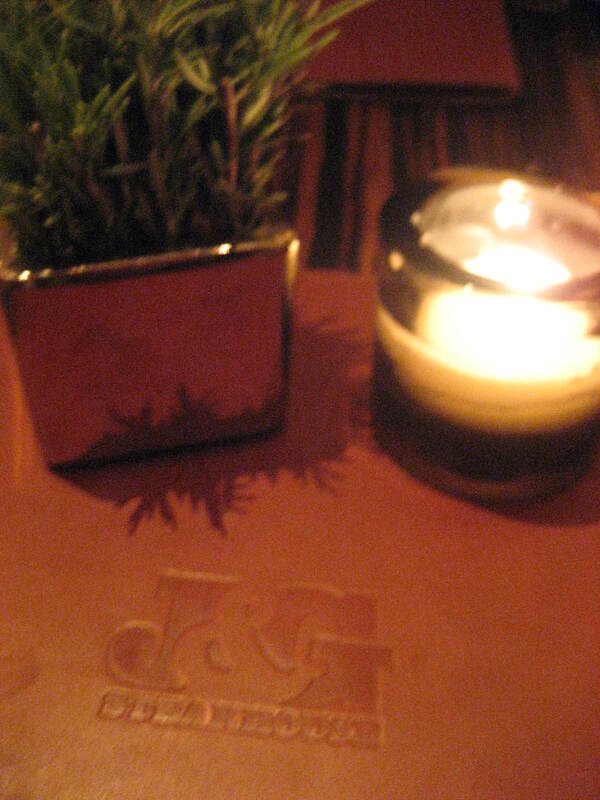 We left satisfied with the meal and impressed with the flavors, more convinced than ever that “J&G Steakhouse” is a colossal misnomer for a place that offers so much more. The Restaurant Week offering was a real value at $35.11, as the pre-theater menu would be for anyone who wants the experience without the hefty price tag of a $46 prime New York steak. And the value in terms of people-watching in the W’s lobby on weekends is a priceless amuse to accompany your meal.